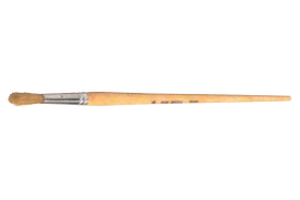 The Round White Bristle Marking brushes are produced by securing white bristle to a wood handle with a seamless ferrule. The bristle is set in epoxy for solvent resistance and the fiber naturally maintains stiffness and shape over an extended period of time. We have six standard brush offerings in various diameters, trim lengths and 7" in overall lengths. These brushes can be purchased in a standard pack of 12 units. Used in industrial or educational applications but also ideal for the fine art applications. Bristle is a versatile fiber allowing these brushes to be popular in various industrial, painting, fine art and general cleaning applications.